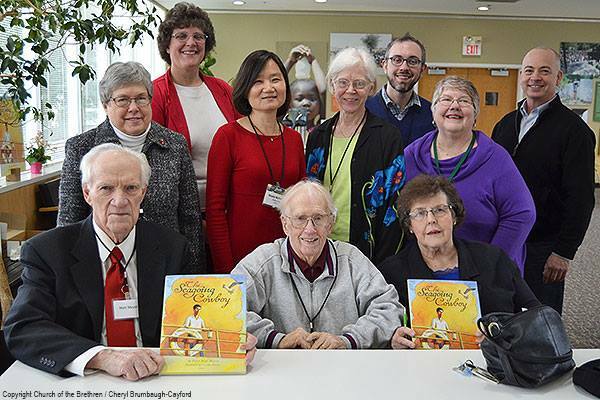 “The Seagoing Cowboy” author Peggy Reiff Miller (at center in the back row of the photo below) joined Brethren Press staff and two real-life seagoing cowboys and their spouses for a prerelease reception with the Church of the Brethren Mission and Ministry Board on Sunday afternoon, March 13. The two Heifer cowboys–Matt Meyer (front left) and Merle Brown (front center)–were presented with copies of the new children’s book. By happy coincidence, in 1946 they served on the same boat taking a shipment of horses to Bremen, Germany; in later years both served on the Church of the Brethren staff; and now both attend Highland Avenue Church of the Brethren in Elgin, Ill.